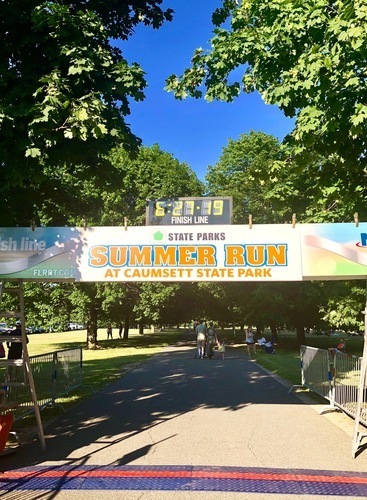 "New York State Summer Run Series Caumsett State Historic Park Preserve 5K"
"Disney Princess Half Marathon Fit for a Queen"
Thinking of breaking in your glass slippers for the very first time? Disney Princess Half Marathon lives up to it royal reputation. Beginning with a grand expo (as in HUGE, perhaps too huge for many) which offers seminars from the runDisney guru Jeff Galloway, to runDisney princess-like merchandise, to products that fill any runners' last minute needs, this four-day weekend running event welcomes tens of thousands of runners. As in 52,000 for the half marathon alone. This makes transportation to the race tricky. Disney provides free buses and monorails to the starting area for Guests staying at their resorts, but expect to depart your on-site hotel at about 3 am to make it through security and to your corral on time for the 5:30 am start. Bag Check is available for your belongings, provided they are presented in clear plastic bags. Expect your fellow princesses (and princes) to be adorned in their favorite regal garb; everything from crowns to tutus makes the grade. The course meanders through the Walt Disney World theme parks and surrounding roadways, and multiple Disney character photo ops are available. (Expect long lines here!) Well-stocked HEALTHY snack boxes, bananas galore, water, and Powerade are distributed post race. Another perk of this race is the gorgeous, princess-themed medal. Really fit for a queen!